This one has spines rather than gills. It tastes bitter when raw (after a few seconds in the mouth) but is nice when cooked, although with a delicate flavour. I have had this fryed with scrambled egg and in casseroles. Realistically it is very difficult to confuse this one for anything poisenous, however please be certain before you eat it. 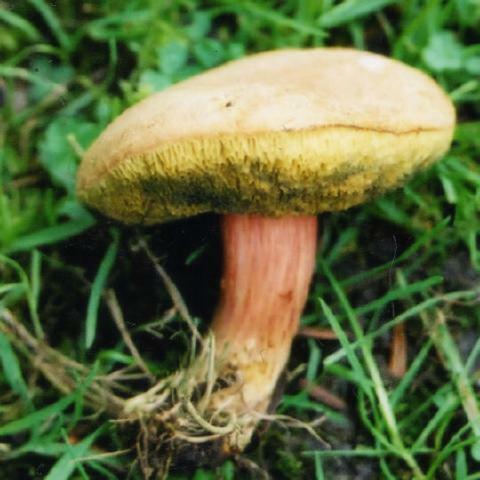 Although a nickname for this is 'trumpet of death' it is quite edible and often listed amongst peoples top 20, if not 10, edible mushrooms. It is difficult to confuse this one but please be certain you have this before eating it. 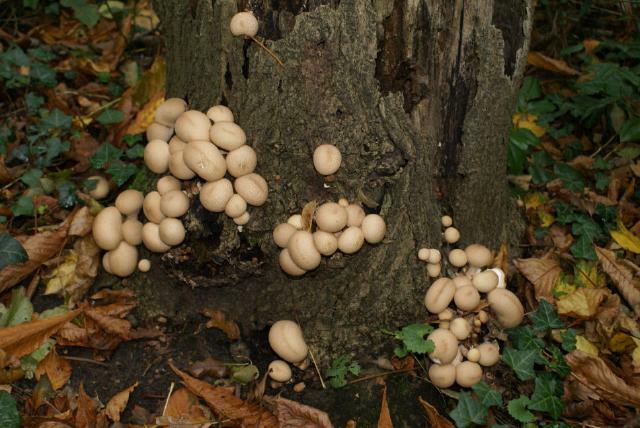 Lycoperdon pyriforme, otherwise known as the stump puffball. Pick these to eat when they're really young and firm, then they have a great flavour. Common enough on dead tree stumps, the individual puffballs are only three or four cm across at most (although they're better when smaller), but when you find a good stump its got so many on its quite startling. I rate this as one of my personal favourites. How do you cook em Cab? When they're young and firm then I like them sliced, sauteed with garlic, parsley and olive oil, and tossed in pasta with cheese. If they're older then they're a soup mushroom. Visualy very appealing this one. Got sort of warts on the upper stem that give off some milky stuff. Really quite variable, but always has lovely yellow spores, again giving off the milky stuff. Quite common with conifers, tasty but slimy. 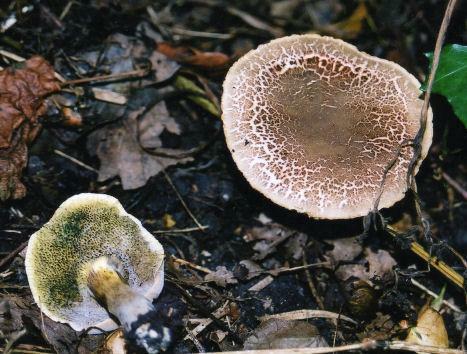 Little thing, rarely more than 10 or 11cm across, not much taller, stem striated pinky yellow, yellow pores that stain greenish when you bruise them in most specimens, cap that starts brown and cracks to red. Grows in association with tree roots, usually broad leaved but doesn't seem to be entirely fussy which ones. Often maligned as an edible, being rathery gooey. But when dried its excellent. Top notch eater this one, really top notch. Common across much of the country, some years its massively prolific. 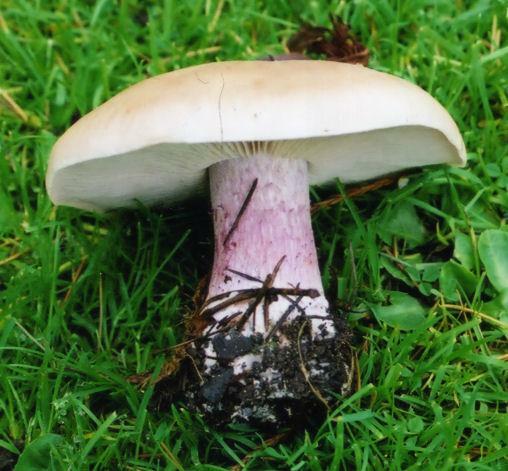 10cm or more, pale pink spore print and purple stem with pale to dirty brown cap, its quite unmistakable. Picked wild and sold in markets in the East Midlands, where its traditionally cooked rather like tripe. Look for it late autumn into winter, find it in rings and troops in pasture. 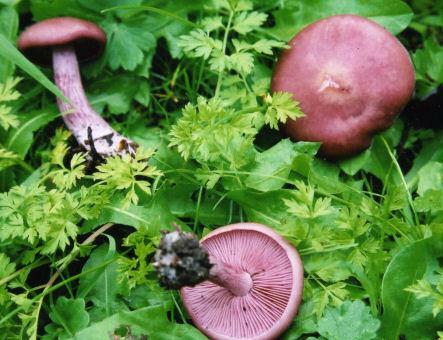 Rather more aromatic than the field blewit, and although it can be about as big across (10-12cm) it frequently isn't. More slight aswell. Rather vivid violet when young, turning to pale brown. Pink spore print, not uncommon in hedges and in woods. 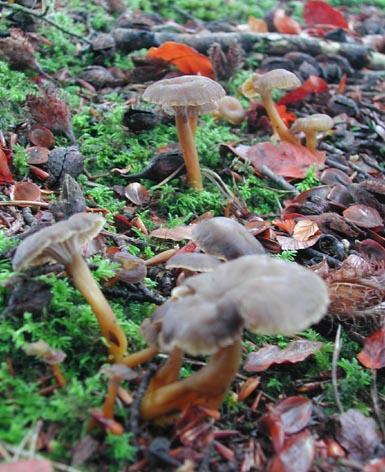 Dead common under conifers, does well under those nasty lelandii. Good eating, makes the best garlic mushrooms and is to die for when stewed down with pigeon and juniper. Here you go a picture of the Helvella crispa - commonly found on the edges of paths. Rogers Guide says its edible but poor - maybe good for stews? Not really got any flavour to it for stews. These one should be the Trumpet Chanterelle, Craterellus tubaeformis (Well I'm still alive after a few month of heavy consumption ). 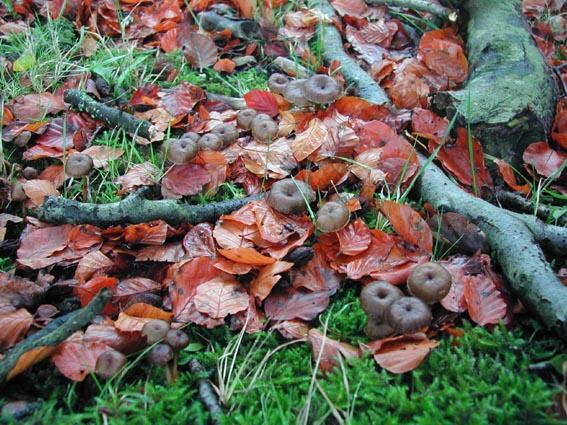 In deciduous woodlands, cap up to 5-6cm, brown, trumpet shape with sometimes a hole going all the way down the stem, can be round or quite wavy on the older ones. 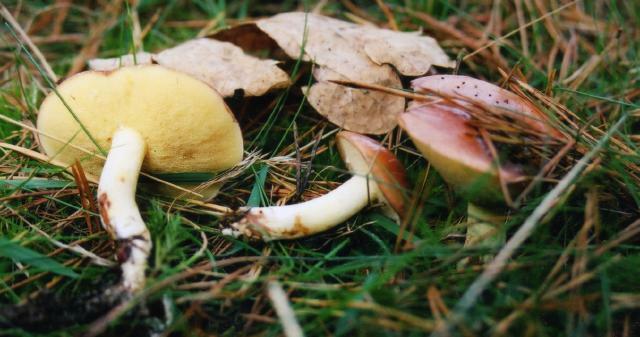 Stem is yellowish and hollow, usually the only thing you see as they are very well camouflaged. Spore print whitish, yellow. 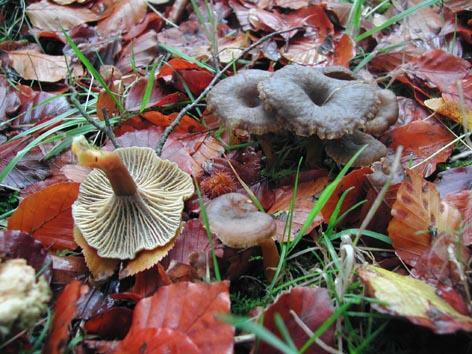 Gills is the way to recognise as they're vein-like rather than gills, a bit like the chanterelles. LOADS of them up here, picked up kilos, and they're suppose to last later in the season! Not a big meal in themselves but really easy to dry whole, and tasty fried in butter or in omelettes. 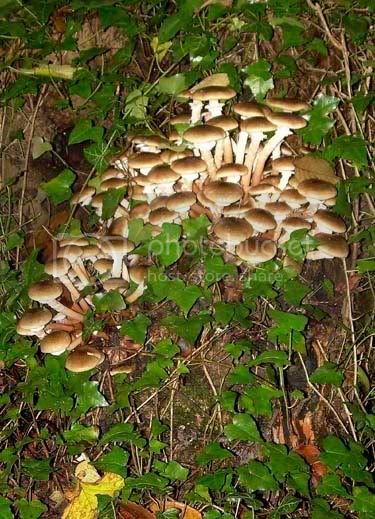 They grow in very crowded clusters, on tree trunks, stumps and roots (the latter looks as if they were growing on the ground). They can kill a tree in a short period of time, and can expand from one tree to another. It's literally a tree killer. Pick the young ones, with convex shaped caps, if you want to eat them. Some people suffer from stomach upset when eaten, thus try a sample first. They need to be cooked for a long period of time. I boiled them for 10 minutes, and them pan fry for 5 minutes in garlic and butter. They taste meaty. I think they can be great in game stews. Hey Bingo, how about posting your photos of that fine Sparassis crispa/ Caluliflower fungus from last weekend on the shroom gallery - good shroom & good photos of it?